In this vital new study, Andrew Abbott presents a fresh and daring analysis of the evolution and development of the social sciences. Chaos of Disciplines reconsiders how knowledge actually changes and advances. Challenging the accepted belief that social sciences are in a perpetual state of progress, Abbott contends that disciplines instead cycle around an inevitable pattern of core principles. New schools of thought, then, are less a reaction to an established order than they are a reinvention of fundamental concepts. Chaos of Disciplines uses fractals to explain the patterns of disciplines, and then applies them to key debates that surround the social sciences. 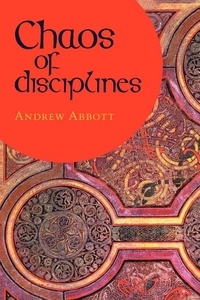 Abbott argues that knowledge in different disciplines is organized by common oppositions that function at any level of theoretical or methodological scale. Opposing perspectives of thought and method, then, in fields ranging from history, sociology, and literature, are to the contrary, radically similar; much like fractals, they are each mutual reflections of their own distinctions.